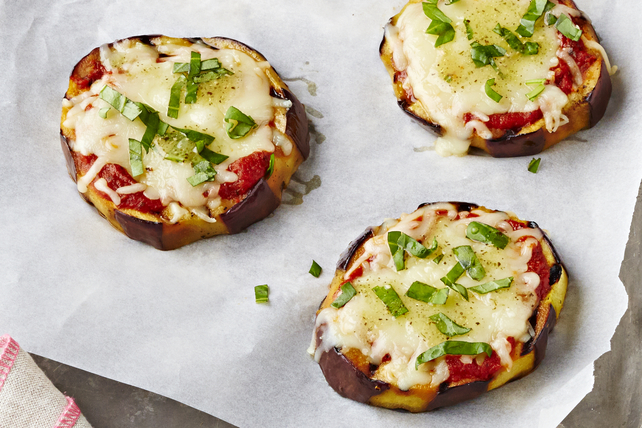 You won't miss the crust in this quick Eggplant Pizza recipe. Grilled eggplant is topped with pesto dressing, pizza sauce, shredded cheese and fresh basil for a simple spin on grilled pizza. Use vegetable peeler to peel eggplant into 1-1/2-inch-wide lengthwise strips, leaving about 1/2-inch-wide unpeeled space between each peeled strip. Cut eggplant crosswise into 8 slices. Reserve 1 Tbsp. dressing for later use; brush both sides of eggplant evenly with remaining dressing. Grill 8 min. ; turn. Top with pizza sauce and cheese. Grill 5 to 6 min. or until cheese is melted. Transfer eggplant to plate; sprinkle with basil. Drizzle with reserved dressing. Prepare using Cracker Barrel Shredded Creamy Mozza Cheese. You can instead prepare this delicious recipe using your grill pan on top of the stove. For best results, keep the pan covered while cooking the eggplant. The entire eggplant is not peeled since some of the peel needs to remain to hold the eggplant together as it cooks on the barbecue.